Product prices and availability are accurate as of 2019-04-23 04:39:08 UTC and are subject to change. Any price and availability information displayed on http://www.amazon.com/ at the time of purchase will apply to the purchase of this product. Type: assisted opening; closed: 4.5"; blade: 3.25" L stainless L standard edge; handle: stainless; other info: extended tang L lanyard hole L pocket clip. 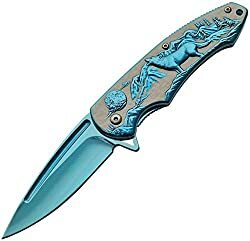 Blue titanium finish blade. Matte gray handles with Blue finish howling Wolf artwork. Boxed.